Do You Know What a Fibroid Is? Home » Do You Know What a Fibroid Is? Share the post "Do You Know What a Fibroid Is?" Some interesting, funny and spontaneous video interviews we did at a recent big health fair. We wanted to share them in honor of upcoming Fibroid Awareness Week. On April 2, at the KJLH Women’s Health Forum, the Fibroid Treatment Collective set out to discover the most intriguing answers to “What is a Fibroid?” (see below) by conducting Man (Woman) on the Street interviews. 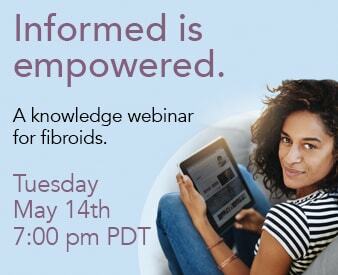 Interestingly enough, many women did not know what fibroids were or knew very little about them, even though 50% of all women have fibroids. We have a lot of educating to do! It is a good thing Fibroid Awareness Week, April 18-23, will help us do just that! Knowing the symptoms and catching fibroids early can help make treating fibroids much easier. Here are some tidbits to get you started. Be sure to share your new found knowledge with a friend! Fibroid tumors are benign (non-cancerous) growths that appear on the muscular wall of the uterus. They consist of dense, fibrous tissue (hence the name ‘fibroid’) and are nourished and sustained by a series of blood vessels. Fibroids are the most common tumors of the female genital tract. They range in size from microscopic to as big as a 5-month pregnancy. Though very common, most fibroids don’t cause symptoms – only 10 to 20 percent require treatment. However, you may experience no symptoms or have mild symptoms, but still need treatment. Ok, so you think you have fibroids. What next? How do I get this taken care of? You should discuss the best treatment option for your condition with your doctor. Traditional methods include surgeries such as Myomectomy and Hysterectomy, which require long recovery times and hospital stays. Another, non-surgical, non-invasive procedure, called Uterine Fibroid Embolization (UFE) cures fibroids with minimal down-time, no hospital stay and little pain. UFE is widely recognized as an effective procedure by the American College of Obstetricians and Gynecologists and the Fibroid Treatment Collective advocates embolization as a safe alternative to traditional fibroid treatments.